Comprised of essays by top scholars in the field, this volume offers detailed overviews of philosophical issues raised by biology. 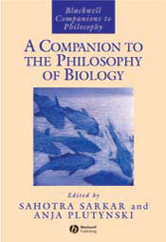 Brings together a team of eminent scholars to explore the philosophical issues raised by biology. Addresses traditional and emerging topics, spanning molecular biology and genetics, evolution, developmental biology, immunology, ecology, mind and behaviour, neuroscience, and experimentation. Begins with a thorough introduction to the field. Goes beyond previous treatments that focused only on evolution to give equal attention to other areas, such as molecular and developmental biology. Represents both an authoritative guide to philosophy of biology, and an accessible reference work for anyone seeking to learn about this rapidly-changing field.